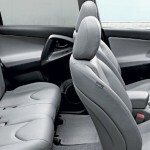 Leather Car Seats – A Custom Option For Your Vehicle. If you want to know about installing quality custom leather car seats in your vehicle then you need to read this article. After reading this you will know the difference between custom leather seats and seat covers; why custom leather seats are your only choice if you wish to restyle your car and increase it’s value and how to get the best deal on quality leather seats. Custom Leather Seats Or Seat Covers? It’s important to distinguish between custom leather car seats and seat covers. Seat covers are exactly what their name says – a cover you put over your existing seat fabric. It’s main purpose is to keep your original seat fabric from getting stained. If, for example, you carry your pets in your car – dogs, cats or other – it would be wise to use seat covers for protection. However, they are certainly not a restyling statement. As they shift with the movement of passengers in and out of your car they can look untidy and actually take away from the appearance of your vehicle interior. Custom leather seats, on the other hand, are designed to fit your car seats like a glove. Each seat kit is made for a specific make, model and year of car or truck and they fit perfectly. But, unlike a glove, they don’t fit OVER your seats. They are an actual replacement for the original fabric covers that came with your car. So the fabric is removed and the leather seat material is mounted on the seat frame so you get that fresh from the factory look and feel. and for many other activities. In short, you may spend up to 3 hours per day in your car. 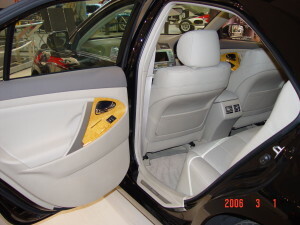 After some time, your car upholstery may begin to look worn or faded or even stained. There comes a time when shampooing will not cut it anymore. What are you to do? 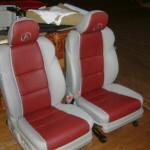 One cost-effective option is to install custom leather seats. You can get leather car seats that are custom made to replace the seat fabric that came with your new car. The old fabric comes off and the new leather takes its place. This is a real benefit because, with years of use, your seat fabric may smell of the various spills and messes that are unavoidable. You get a fresh start in more ways than one. But you’re not just getting the option to replace your seats; you are also getting an option to restyle your car and make it look like new again. You can give it a look of elegance and luxury. Where Do I Get A Great Deal On Custom Leather Seats? Don’t look to your dealer’s showroom because you you are unlikely to get a great deal there. You may ask why. Well, for large manufacturers customization costs a lot of money. They keep costs down by having large runs of the same model. They will choose popular colors and fabrics and within these limits offer some choice. For smaller customization runs they will package, for example, the leather seats with a high end electronics package and some other goodies. This package may cost $4000 or more. If you don’t want the extras this makes your leather seats very expensive. These upgrade packages are not offered on all models so you may be out of luck even if you were prepared to pay for such a package. These packages are an option only at the time of sale. If your car is a few years old you are out of luck with the dealer. Happily, there is another, much more cost-effective and affordable option open to you. And the good news is that in the aftermarket you can get the same quality as you would get from your car’s manufacturer. The aftermarket manufacturers and restylers offer custom leather car seats for almost every make, model and year of car, regardless where it was manufactured. They specialize in custom leather seats and have many kits in stock made to factory specifications. So you only pay for what you want. Whether your car is a 2-seater, has two or three rows of seats you can get the seats you want for your car. You also get a choice of a wide range of colors and textures and you can add special stitching, piping or embroidery to suit your taste. Obviously the cost will depend on your number of seats and also on the extras you choose to add. But you will be pleasantly surprised at the cost of this affordable luxury. With this information you are well equipped to shop for custom leather car seats that meet your requirements. A great place to start is here. Just click the link to get even more information about custom leather seats.